If you ever needed a lesson on how not to address a colleague at a public event, then Tamil actor T Rajendar's recent tirade against co-actor Sai Dhansika offers the perfect case study. Actors Krishna, Vidharth, Dhansika, Rajendar and actor-director Venkat Prabhu were promoting their upcoming film Vizhithiru at an event on 28 September. While thanking her co-stars in the film, Dhansika forgot to mention Rajendar, who makes an appearance in one of the film's songs. What happened next, is shocking and shameful. 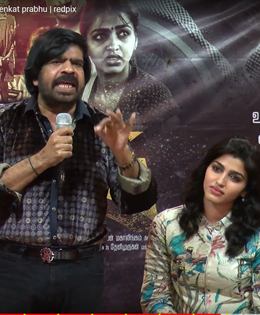 When it was T Rajendar’s turn to take the mike, he insulted Dhanshika for her lack of manners. He said on stage, “Dhanshika acted with Superstar she did Vizhithiru; that’s why she’s asking who is T Rajendar. It’s not as if my life depends on her saying my name.” When she tried to get up he said, “Please sit. You are a big artist. None of the other men on stage including director Venkat Prabhu, actors Krishna or Vidharth said anything or tried to stop T Rajendar. In fact, they are seen laughing at the things T Rajendar was saying! Vishal issued a notice condemning T Rajendar for continuously targeting Dhansika despite the fact that she apologised to him. Vishal stated that it’s common to forget names on stage. “Director TR is a multi-talented senior person. It's very common for a person on stage to miss mentioning names while addressing a gathering. I have myself, forgotten to mention or thank certain people or the ones sitting on the dais in the past,” he wrote on Facebook. Even after Dhansika repeatedly apologized, T Rajendar continued insulting her. He said, "You haven't come dressed in a saree and you are saying sorry." Later, when she said that she had great respect for him, he asked her where he could go and sell her respect. He then lectured her on how to conduct oneself onstage. Despite apologising, he did not pardon her, said Vishal. “Dhansika apologised and even fell at Mr TR's feet, after he pointed out that she missed mentioning his name. Mr TR didn't pardon Dhansika who is as old as his daughter,” he stated.